The situation in Syria is escalating very quickly now. Some reports suggest that U.S. strikes have already begun and Assad's forces are fleeing the southern border. Fox News is reporting that Russian warships have fled Tartus. The current situation precipitated from the large-scale gas attack on Douma on Saturday and Israel's subsequent attack on the Syrian government's T-4 airbase. Brigadier General Hossein Salami of Iran's Revolutionary Guard has issued an eerie and sudden warning to Israel that strangely foreshadows both the Isaiah 17 and Revelation 12 prophecies. Whether a shadow of things to come or the real thing, time will tell. Below are translations of his two tweets today (my emphasis in brackets). Don't trust in your airbases; they're within reach. Don’t have hope in US and UK; when they arrive, you won’t be there… Smallest goal will be your existence. You can’t bear. When you escape, you’ll have no way but to the sea [See Rev. 12:6, 14-16]. Hands are on the trigger and missiles are ready and will be launched at any moment that enemy has a sinister plot… North and west of Israel are at the intersection of fire [See Is. 17:3-6]; you will not escape [See 1 Thess. 5:3; Rev. 12:5]. You live in the dragon’s mouth [See Rev. 12:3-4, 15-16]. We are certain of our capabilities to protect ourselves with our own power. That's the problem Bibi. Your faith is not in God and His Christ, but in the IDF and as the prophecies in your Scriptures clearly state, that misplaced faith is what will cost your country dearly. Your nation will not be rescued until it finally affirms "Blessed is He [YESHUA] who comes in the Name of the LORD." Only Yeshua can save you from your numerous enemies. Intelligence reports suggest that Iran is preparing for its first ever direct assault on Israel in retaliation for recent attacks. Here we go. The Sun is reporting that Israeli warplanes have launched fresh airstrikes in eastern Damascus! Reports are coming in that an airstrike was attempted against a major regime airbase near the western city of Homs. 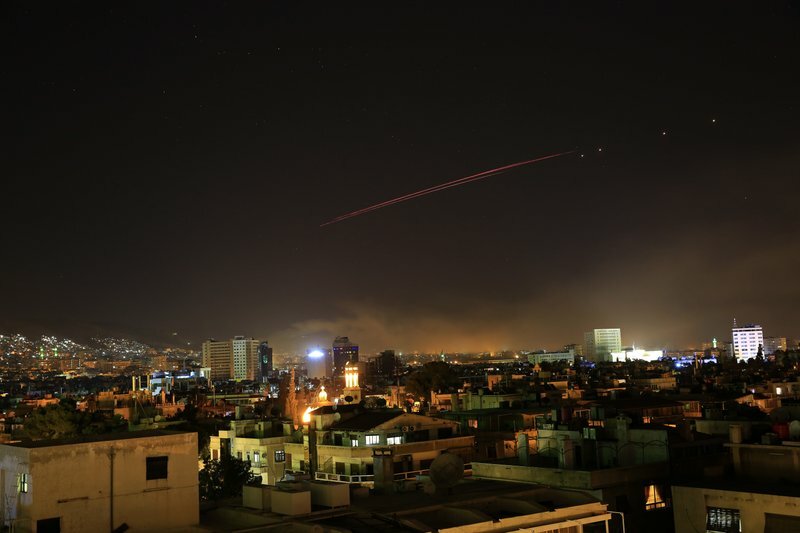 Apparently eight or nine missiles were shot down by Syrian air defenses. The weapons storehouse at Iran's largest military base in Syria has allegedly been destroyed by Israeli aircraft. Debka reports that Russia has deployed Tu-95 and Tu-22M strategic bombers to Iranian airbases and Russian freighters carrying fresh military equipment to reinforce the Syrian army have crossed the Bosporus. Israel declares a no-fly zone over the Golan Heights in the north part of the country, and east of the Jordan River, for the rest of April, effective immediately. Is the IDF preparing to hit southern Lebanon and southern Syria to root out Hezbollah? Hezbollah units have evacuated to Lebanon in preparation for the possibility of confrontation with Israel as coalition airstrikes are underway in Syria. President Trump has announced that coalition strikes have begun against the Assad regime's chemical weapons facilities across the country. Reports are coming in that explosions can be seen in around Damascus. The President is asking for prayers for the armed forces and for the Middle East and is condemning Russia and Iran for condoning genocide. Nikki Haley addresses reporters before an emergency United Nations Security Council meeting this morning confirming that the U.S., France, and U.K. have all confirmed the chemical attack and that something must now be done. Her comments suggest there will be no turning back from a military campaign. 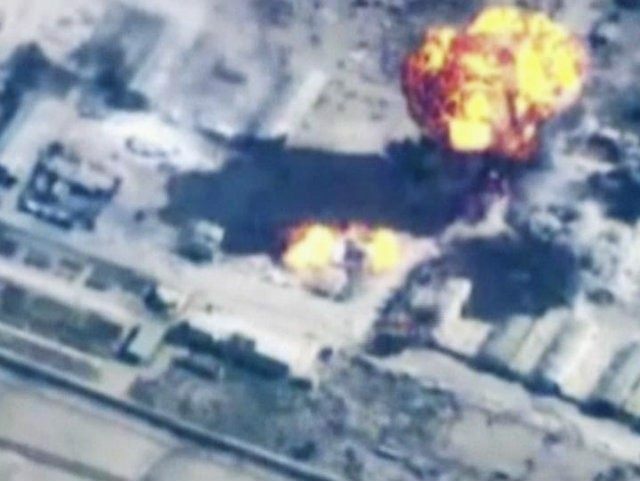 U.S., France, and U.K. are crafting coordinated plans for large-scale airstrikes in Syria. Officials from all three countries are now in unanimous agreement that the Douma chemical attack came directly from the Assad regime. U.S. Secretary of Defense James Mattis warns that an overstep could trigger a direct war with Russia and Iran. French President Emmanuel Macron says France has proof that the Syrian regime was responsible for the chemical attack and he is currently weighing military options in conjunction with the U.S. and U.K. The White House is holding a press conference at 2:30 PM to address the Syrian situation. You can watch it live right here. Iran and Russia likely planning counterattack to Israel's opening salvo on Syria's T-4 airbase. Benjamin Netanyahu is holding a series of consultations with IDF leaders as fears spread that Moscow and Tehran may be planning an attack on Israel's interior. Harry S. Truman Carrier Strike Group, with 6,500 sailors, apparently left harbor from Norfolk, Virginia this morning, now en route to the Middle East. The Truman has been deployed. Things just got real. We have many many months of tough times ahead...once those tough times start. Mark my words here, we will still be here this time next year. Only God knows the future... Only He understands the intent of scripture and prophecies fully. If He wants to do a mass Enoch-style Rapture, it will happen. If He wants to protect His children like He did Daniel's three friends in the furnace, it will happen. If He decides that all the saved will fall dead to be with Him... It will happen. It's His decision, not ours. Even so, come Lord Jesus! Maranatha! Amen Kris and Ecclesiastes 10.2. And I think you are wrong Stanfoster, but it doesn't matter to me, because nothing can separate me from Him, my heart, my guts, my soul and my mind are all His -- Jesus Christ the Son of God, who died and rose again for me. Thank you Jeramiah! I have been well praise the Lord. He is refining and growing me yet. I'm here brother, not going anywhere for my anchor is the Lord Himself. Bless you good brother. I just finished rereading Ezekiel 38/39. Think we are definitely seeing prophecy come to pass. Excited, but yet need to pray for those about to lose they're lives. May the hand of God be swift. Moses to the people of Israel on the coming of the Army of Pharaoh. 13 And Moses said to the people, Do not fear, stand still, and see the salvation of the Lord, which he will show to you today; for the Egyptians whom you have seen today you shall never see them again. 14 The Lord shall fight for you, and you shall hold your peace. 17 And I, behold, I will harden the hearts of the Egyptians, and they shall follow them; and I will get honor over Pharaoh, and over all his army, over his chariots, and over his horsemen. 18 And the Egyptians shall know that I am the Lord, when I have gotten honor over Pharaoh, over his chariots, and over his horsemen. Miguel P....I am not trying to argue, but state my opinion. Will you agree to say I was correct when April 11th, 2019 arrives and we are still here discussing such topics? I would love to come to you at the throne before then and say ..."You were correct"...and I promise I will. All I ask is the same respect back a year from now. Of course prophesy is unfolding and much more is to unfold. The largest revival this planet has ever seen is soon to be here, amongst much anguish as well. I am preparing to help my family and others as much as possible. Stan, I mean this in a kind way because I know how written words sometime come across, but it doesn't make you correct if it happens that way (with 20-20 hindsight later). Giving dates that the rapture cannot happen before is no less an example of date setting than picking a date. It's easy to say that the rapture won't happen by a certain date because you know if it did, you would never be called on being wrong. It's a zero risk gamble to say what you are saying unless you think as sinless beings in heaven your brethren will call you out about it (I doubt finger pointing and mocking will occur in heaven). StanFoster, I appreciate the dialogue. No offense at all, nor do I mean any toward you. I will gladly apologize if I am wrong about my expectation and hope that Jesus will rapture us within the next 90 days (my current sense is that God could and might take us to June 30). It could be tomorrow or a couple more months. I have no certainty other than this appears to be the season and there are a lot of dedicated watchers who make a great case for the next several weeks. These ideas are also based on several areas of the Bible . I am unclear though on a lot of details and as the days pass the Holy Spirit reveals more and more to me. I am open minded because I know how errant I, a mere man, am. The case for pretribulation is stronger than mid or post in my humble opinion. Why do you believe there is only ONE? Could there be a pre trib ESCAPE of the Bride and a mid trib RAPTURE of the Church. Because this is what I believe. When people cannot agree because of the different verses, it is because different verses speak to different groups of people. Just like there is God, Jesus and the Holy Sprit...we also have the Jews, Church, and BRIDE of Christ. A pre trib and mid trib are both correct. 2 Corinthians 12:2-4 Paul sees a man (a group of people I believe) that gets taken in spirit (like a Rapture, but NOT a Rapture) into the THIRD HEAVEN. Then he sees another "man" taken in body (twinkling of an eye) to PARADISE. I believe this shows us there are two groups of people being taken to two different places. When the Bride is taken, I believe their bodies are changed into light, or just their spirit gets taken. This is why in Luke 21:36 we are to "watch and pray always that we are accounted worthy to ESCAPE all the things which shall come and to stand before the Son of man." Who stands before Jesus? His BRIDE! The Church (lukewarm, Jezebel spirit, false doctrine, etc) of course will be left behind and they will be taken at the Rapture if they overcome, once the dead in Christ are resurrected. If you continue to read to Ch. 14, it says Jesus will come a THIRD TIME, but this time for the Jews...and they will NOT be burdened. The first time the Bride was taken, second the Church, and the Jews were burdened with the tribulation period. The Jews will se Jesus when He comes down at the END of the Tribulation period. And Paul says he saw this "man" above 14 years ago (14+)...which I believe stands for a 14 year tribulation period. Don't know why so many believe the Tribulation period is only 7 years, as there is no mention of a 7 year trib period. Not only did Noah's dove find an olive leaf 14 days after he released her, but Jacob also served 7 years for Leah and 7 years for Rachel. The events of the book of Revelation cannot fit into a 7 year period of time...many believe that 42 months, 1260 days, and time, times, and half a time are the same time frame....but they are their own independent time frames. Pslam 90:10 also speaks of a generation being 70 years, but if by reason of strength, 80 years, but those 10 years will be with labour and sorrow, then they fly away. This is speaking to the Jews. If you think about it, the Jews do fly into the wilderness the last 3.5 years of the trib period. No offense meant but what you described here above is totally unbiblical! The Bride and the Body of Christ aka the Church is ONE and the same! All who believe in the Son of God and put their trust in Him therefore sealed by His Holy Spirit will be raptured before the Tribulation happens! This is what is described in the Scripture plain and simple and this is not up to debate in my mind. Amen amen amen siater Nora amen you are 100 percent right and thats the truth and a fact and is not up for debate ever amen and maranatha !!! PART ONE - Tabitha I pray you read the letters to the churches - not boxes or buildings - but people who are in the spiritual conditions described by Jesus Himself in those letters. There is only one group of "believers" going into the Tribulation and that is Laodicea because they are believers by Head Knowledge only, not heart TRUST in 1 Corinthians 15:1-4. He tells them to "buy" of HIM gold tried in the fire - how do you buy from Jesus - in the fires of Tribulation because you didn't accept His FREE gift of Salvation. Pergamos and Thyatira make up the one world religious system - their lamp stands will be removed for they are no longer even professing members of the body of Christ - we're already seeing that with the Pope's denials of our right to approach Jesus individually (Nicolatianism), He proclaimed Jesus death on the cross as a failure and Mary is now a co-redemptrix - absolute Blasphemy all. These are the positions of the harlot church - the one world religious system of The Tribulation. Only one "church" goes into Tribulation - the head knowledge, think they have it all figured out, no heart connection or relationship with Jesus Laodiceans. Thank you Nora for your comments regarding Tabitha's comments. I think of those who have said as to a partial rapture (or several) that when Jesus returns for his church, for we are His body, he takes all of His body, not pieces of it, not a leg or an arm etc., but the whole body! He is the Head of this body. It is not our righteousness that we approach the throne of God, but it is Christ's righteousness. It was truly finished at the cross. All of it. It is His faithfulness that keeps us, not our faith, or any of our good works. Because, we have believed on His Son, on his death, burial and resurrection who took upon his body the penalty of sin and we who acknowledge Christ as our Savior and Lord because of ehat and who He is. Good works are done out of love for Christ, not to keep our salvation or prove our worthiness, etc. Our worthiness is as filthy rags, and that cannot change. It is marvelous to be living in the Age of Grace! In several translations for 1 Corinthians 15:1-4 (HCSB, KJV, NASB, and even the NIV) it says "are saved" not "being" saved as the ESV. We are saved - all of us, each and every one of us. Not a part of us or a piece of us - we are completely and eternally saved. The work of God is to believe in His Son who He sent. Christ on the cross paid the sin price while we were yet sinners and He is the sin offering. Not us. Whether we live or die, we are already His. Amen Cathi and Nora - What a nasty trick of the devil to make someone believe they're hanging on try their fingernails and probably aren't going to make it. That is not the character and nature of My Father or His Son! p.s. : Btw, you pointed out what I've been thinking for quite a while: false doctrines/teachings and incorrect/unbiblical notions are very much againts (an attack on/ and an offense to) the character of the Lord! Sherry and Nora - Do you believe the resurrection and the rapture occur one right after the other at the same event as described by Paul in 1 Thessalonians 4:15-18? If so, how do you reconcile this description of the resurrection with the resurrection described by John in Rev 20? Is it not the same resurrection? In Revelation 20:4-6, it is called the First Resurrection AND it includes the martyrs who were beheaded during the great tribulation. How can it be the FIRST Resurrection if it occurs 7 years AFTER the resurrection that happens just before the rapture like you suggest? Isn't there only one FIRST? You said yourself that God is not the author of confusion. Remember - the resurrection occurs PRIOR to the rapture. 1 Corintians 15:22-23 also indicates the exact order..."For as in Adam all die, so in Christ all will be alive. But each in turn. Christ the firstfruits; then WHEN HE COMES, those who belong to him." This chapter is all about the resurrection. The dead in Christ rise FIRST...BEFORE we who are alive and remain are raptured. It is the order of things laid out by God. If there is a resurrection that also occurs after our rapture that would include all the martyred saints, then it would be called the SECOND Resurrection but it is not! Also it would go AGAINST the order in which God laid out...first those that are dead in Christ then those who are alive and remain. A huge gigantic Amen amen amen sister Sherry you said that amazingly and its the truth every single word amen my sister in Christ I am super ready to meet you and all my brothers and sisters in the air amen and maranatha! @Tracy I can relate to why the time of ONE and FIRST resurrection for believers described several times 'one at a time' may seem confusing to you but please accept the idea that we shouldn't mix up TIMELY things and time points with ETERNITY where such a thing as time simply doesn't exist. The bible explains things from our human and time-bound background mostly, but how can sth eternal be explained to a not-yet-eternal being? This must be confusing sometimes as long as we stick to our human point of view. I will watch the video you suggested but I am also requesting you consider the follow scriptures I present. I am hoping that I am not coming off as rude...just trying to reason through this together as God instructs us to do. B) continuously thought tribulation as people are dying in Christ. 1) 1 Corinthians 15:22, "But each in his own turn: Christ, the firstfruits; then, WHEN HE COMES, those who belong to him." (Notice also the next verse says, "THEN the END will come."). I emphasize "when he comes" because it is telling us the resurrection happens only when Jesus comes. It makes no reference to people being resurrected at any other time. How many times does he come? Once? Twice? Multiple times? - Daniel 12:1-2, "At that time Michael, the great prince who protects your people, will arise. There will be a TIME OF DISTRESS such as has not happened from the beginning of nations until then. But AT THAT TIME your people- EVERYONE whose name is found written in the book- will be delivered. Multitudes who sleep in the dust of the earth will awake: some to everlasting life, others to shame and everlasting contempt." This is clearly a resurrection passage. Please note that it happens at a great time of distress (aka great tribulation) AND it includes EVERYONE whose name is found written in the book. If there will be other people resurrected after this time like you suggest, then their names cannot be found written in the book - so that would mean "trib saints" wouldn't be written in the book. That does not make sense. Based on these scriptures (and ones stated earlier), the First resurrection is not divided into multiple sections, it happens only just before the rapture, it includes martyred beheaded saints from the tribulation, it includes everyone whose name is found written in the book, it happens during a time of great distress, and it happens on the last day. May God be with you as reason through these scriptures. Dear Tracy, I do suggest you watch the video first, you will easily see that there's no contradiction at all between what I told you about time and eternity and the scriptures you quoted. What Steve Sewell put in the video regarding past events on a time bar you can as well put into the future of time. God is BEYOND ANY "TIME" as He created this dimension in Genesis 1:14 together with the sun, moon and stars of the universe but His eternal realm is NOT AT ALL involved nor affected by time in any way. Blessings to you! Annabel, I watched the video as promised but I do not believe all of what that gentleman shared. I choose to believe that God gave us words such as after, before, when, then, at that time, first, last, beginning, end, once, seven, one and only, Alpha, Omega, eternal, and forever for a reason. It helps us understand who God is and what His plan for us is. Without time indicators, nothing would make sense to people, whom by His very own design, are currently confined to living within this time system. While time may not exist in eternity, it does exist now. God created time for us on earth for a purpose. His God breathed words in the bible are for our present understanding. While many things still remain a mystery and beyond our human understanding, when God GIFTS us with words that are time markers, I choose to listen and pray for wisdom to understand. Yes it is God's decision when we will be raptured, but he has laid out His plans through His prophets and those words have been given to us to discern with the help of the Holy Spirit. He will not change His mind about what He wants; the plan will not change. Whether you or I know His plan is a different story. I agree with Stan...I believe there will be tribulation and much more time to spread the gospel and to endure until Jesus returns. As in Daniel 12:10, "Many will be purified, made spotless and refined..." during this time. Jesus said, when you hear of wars and rumors of war, DO NOT WORRY because the end is STILL to come. IMO, 2 Thessalonians 2:1-5 clearly states that we won't be raptured (gathered to him) until after the Antichrist is revealed. I know most brothers and sisters on this site do not believe that; however, I pray that when the rapture does not happen until later than expected that people don't fall away and that your love for Jesus remains as strong as ever. While it does seem that many people who visit this site are strong believers in the Lord, I know that there are probably other Christians who are desperately holding on to the thought of be taken out of here before it gets tough. I pray that God will give us spiritual, emotional, and mental strength to get through what is about to happen on the face of the whole earth. While this message may not be well received by most, I am trying to be a faithful stewart to what the Lord has laid upon my heart. Thank you Gary for being there with information for us all, and for being a light in an ever darkening world. Thank you brothers and sisters also for being there with encouraging worlds always. I know that the Lord has not given us a heart for fear, but I seem to find that I’m needing to remind myself of that lately. But it is comforting to have you all here, we’re in this together to step forward in boldness. Thank you Gail for your enciencoura words to us all. Tracy...Thanks for your excellent post. I likewise know by studying the Bible that we will be here quite awhile. God's word spells it out in several areas...all saying the same thing. It took me almost 3 years of unlearning what I just accepted as gospel...but several pieces didn't fit. They clearly fit now, but one has to start with a clean slate and an open Bible. I likewise know by studying the Bible that we will be gone soon. God's word spells it out in several areas...all saying the same thing. It took me almost 3 years of unlearning what I just accepted as gospel (post-trib)...but several pieces didn't fit. They clearly fit now, but one has to start with a clean slate and an open Bible. I’m sure most of my brothers an sisters here in Christ feel the same. Not trying to change anyone's mind because so much has been written and said by this more intelligent and biblically knowledgeable ... I see 2 Thessalonians 2:1-5 referring to the day of the Lord as the time of Jacob's trouble (7 years) and not just the time of the Abomination of Desolation that the apostle Paul is talking about to the Thessolonias. They had thought they were in it because of the persecution they were living in. So Paul's point to them is of course they are not in it, because this hasn't even happened yet and he reminds them of the things he has told them before. I don't think we know what this entailed. I kinda like what Jan Markell says at Olive Tree Views, it's the Blessed Hope, not the Blasted Hope. Amen sister Cathi and maranatha ! Our blessed hope yet here lately everyone seems to want to make it the blasted hope ! The mid Tribulation rapture is the one I believe. But then we are now almost at the mid Tribulation. Iran is the enemy breathing death threats to Israel. Iran is now confronting Israel in Syria. Israel calls Iran as its enemy on the north. So Iran is the King of the north mentioned in Daniel who will confirm the covenant with many. Iran signed the nuclear deal with the seven great nations of the world promising to use nuclear power only for peaceful purposes. But Israel fully opposes the deal and says that this deal gives power to Iran to destroy Israel and the world. Mr. Trump has threatened to throw away the deal and Iran has threatened that it can go nuclear within a matter of days if the deal fails. May 12th is the due date for that decision. Ships from Cyprus will come against the King of north. Then the King of the north will come in rage and place the abomination of desolation in the sanctuary fortress. We now see Ships stationed at Cyprus ready to go against Syria. But Iran is the one backing Syria. So Iran may get infuriated and retaliate. The mid Tribulation is the time when the antichrist will be revealed to the world. Soon after he is revealed the rapture will take place. If Mid Trib were true, we would know exactly when the Lord would return....3 1/2 years from then. I don't buy that. I believe Pre Trib, but as others have said: It doesn't matter...God's plan is perfect and if we believe it is any moment are we not likely to witness sooner, stronger, with more urgency so more can enter the kingdom? 3.5 years from the ac ending the agreement for worship in the temple that is. Which if you were post trib it wouldn't work for the same reason. Amen amen amen sherry you are on it today and I am loving every single word of truth you are giving amen ! I can't recall if I have mentioned this before, however Jacob Prasch has a very good book on some of this called harpazo: the intra-seal rapture of the Church. Its very long and you may screw up your face with some of the teachings, but much of it is extremely good, particularly when looking at old testament typology. IRAN signed the Nuclear Deal with the seven Great nations of the world on 14th July, 2015. It is now nearly 3 years since the Deal is signed. SHIPS FROM CYPRUS WILL COME AGAINST HIM. When the AC is revealed to the world the rapture will happen. Well maybe my pastor has it right, pan-trib. It will all pan out in the end. Whether pre,mid,post; how are we doing at following Christ? We all have massive red woods growing in our eyes. My hope is in John 14:6. He is the truth, the Life. Live for him now and stop seeking dates. Dear Annabel, I'm pre-trib myself. That's why I enjoy this website so much. I was just pointing out that no matter what people believe we need to live for Christ now and focus on his will in our life. Love everyone here sharing they're thoughts. Iron sharpens iron. Bless you for thoughts. Hope to see you soon in the clouds. MARANATHA!!!! The Jews Have Been Unknowingly Praying to a Roman Garrison For 2,000 Years! There are several documentaries that have come out starting almost 10 years ago proving this as a fact. The Temple Mount in Jerusalem was where the Roman garrison was located and not only do the writings of Josephus and contemporaries at the time prove it, but so does scripture in the bible itself. This is also starting to dawn on Jewish authorities. What's amazing is that for 2,000 years the Jews have been praying to the very fortress of their Roman enemy that destroyed the last Temple in 70 AD. It's almost a foreshadow of what they will do when they accept the antiChrist. It's amazing that this is starting to come out as we approach the prophetic 70th year after Israel's founding and it's revealing is without a doubt a God thing. I have seen some interesting archaeological and historical programs on digs in the City of David. The hillside below the Temple Mount is where some believe the Temple would have been found. Exploration of the area has found underground water sources and areas that are indicative of preparatory for animal sacrifice. The last one I watched suggested that the Western Wall is the remaining foundation of the Roman Garrison. It makes sense given that the highest point in the area provides the most military advantage. The Romans would likely want that. "You see all these, do you not? Truly, I say to you, there will not be left here one stone upon another that will not be thrown down." Just my opinion but I would rather take Jesus at His word and take it that NO STONES, NOTHING will be left. Nothing. Thus, the Western Wall may very well be just part of the Roman fortification. As a footnote, I would like to add that I have nothing but the greatest love and respect for my Jewish brothers and sisters. My comments are not meant to disrespect or malign the faith. I like so many others here were grafted into Israel via Jesus and those roots are dear to me. Pastor Rich, Blessings. Allow me to add a detail to that tale which many do not know and which beautifully illustrates the absolute PRECISION of Our Lord's Prophecy and the inerrancy of your post. We know that the Temple was adorned with Gold. When sacked, the Temple was burned, cause the adorning Gold to melt. My understanding is, that to recover EVERY SINGLE SPEC of that Gold, the Roman Commander ordered the Temple ruins be manually deconstructed and EVERY STONE immersed by a Smith to insure not missing one drop of treasure from the sack, at a time when Rome was not so plush as in days past, and the Temple Treasure, in ALL of its forms, was a hook in the jaw, of sorts, then, as well. Reconsider Our Lord's Words now, hmmmm, Maranatha! I wonder if this is the plot mentioned in Psalm 83. Like the news that prayer was carried out on the temple mount recently unhindered (for the first time in a very long time), God seems to be allowing the Police and Waqf to be blinded to God having his way with giving hints of what is to come on the Temple Mount. T&T, Amen!, saw that one but had slipped my mind in the flurry of the day. "29 And (they) rose up, and thrust Him out of the city, and led Him unto the brow of the hill whereon their city was built, that they might cast Him down headlong. (Luke 4:30, KJV, emph mine) AMEN, again! and Maranatha! Double Amen MARANATHA to that!! Wow, the strike has been ordered. Coalition of US, UK and France, on Syria! Trump live tellong the world the missle attack is under way now @!! Wow here we go. Bombing has started in Syria. We really are living in the last days. Don't know when the Lord is coming back but I sure am glad to know him as my savior. It sure feels like things are going to get really bad, really fast. Even so come Lord Jesus! Damascus destroyed in one day? Friday the 13th no less. The media is saying that Trump has assembled the largest Naval Armada since 2003 for the Gulf war. Unless it's only precautionary in case Russia jumps in, it seems like it will be bigger. Iran has threatened to attack Israel if the U.S. attacks Syria and of course Israel still has four more weeks of border skirmishes with the fakestinians who will happily offer themselves up as cannon fodder to ignite all of this even further. It will be interesting to see what Erdogan does. If Israel gets attacked by anyone and responds I cannot imagine how it will not get exponentially bigger, but I could be wrong. Having this all happen on the eve of Israel 70th anniversary seems incredibly prophetic to me. Yes, definitely not over with the largest U.S. armada since 2003 on the way to the eastern Mediterranean. Russia and Iran will have to find someway to retaliate to save face, which is where this could quickly get out of hand. Could it just be a show of force to intimidate anyone from starting more? Like bringing your biggest friends along to a school yard fight? AlphaFaith - Pastor Wade Hurt has an interesting take I had not considered. I'm not saying he's right, I'm simply saying it is a different viewpoint which should be considered. He loves God, He hears the voice of Holy Spirit and that makes him worthy of a listen in my book. Don't miss his prayer at the end - it's less than 15 minutes and shorter than that if you play back at 1.5 speed and its still easily understood. Dear Sherry I get some "Blessed Hope 2018" channel video about a possible Pentecost rapture by Steven Sewell when going to the YT link you posted? Amen and Amen - I know he wants it stopped, but there has to be action taken as well. How DEEP and how WIDE a question for us? What then will we say? What then will we do? The Sea of Death He has parted, and will part, for us that we may worship Him on the other side in His holy presence. How DEEP and how WIDE are "ALL THINGS" that He will freely gives, has given and will give? Pray ceaselessly my friends. Pray ceaselessly for the courage of the saints, the redemption of the lost and that all eyes turn to the LORD in these days that His name be lifted up and exulted. Holy Spirit convicted us one heart at a time according to Your holy will. Instruct us and teach us, guide us daily in the steps that we take. May they not be departing from your path but walking in step with You. Bless us to be a blessing. Lift us that we my lift others. Love us that we may love others. May we be reflections of your truth and grace to extol justice, mercy and faith. Guide us by Your mighty right hand I pray, In Jesus holy matchless and powerful name. Amen. Indeed He does have every thing in hand, Sherry. Indeed He does! Confirmed and may be Israel. More updates at the top of the post. Israel has declared a NFZ in the north. Russian strategic bombers in Iran. I found some other hint in one of my German resources (not MSM) to solve the question why things didn't play out (yet) as expected when everything was right in place to strike Syria more effectively. The "Epochtimes" article I refer to mentioned the whole setup as some strategic DIVERSION to the 'swamp draining' efforts by Donald Trump. It referred to an investigative journalist David Seaman (fulcrumnews) who nearly was murdered to stop him revealing diverse crimes regarding the Pizzagate scandal. I didn't yet notice that in the meantime app. 20,000 indictments have been confirmed just in April 2018 against members of the US Deep State cabal elite (Clinton, Obama, Podesta etc) so this might be another element why events - such as entering into WW3 - still are being delayed. To me, this makes sense in the light of Luke 12:2-3 which describes some kind of revelation but which has also come to an end somehow if these people are going to be issues with a final sentence. It MIGHT be that they will try to fight this out in a Revelation 13:3 assassination attempt but I'm really unsure if we will still be here to watch this develop on earth. I rather assume we will already watch from above then. God is in control of the perfect timing as certain figures still have to get positioned like on a checkerboard to make the final 'Game over' move... Can't be very long though, this might be a matter of weeks / days now. MARANATHA! Sherry Griffin, What is your user name in the discussion forum? I love what you have to say and I'd like to pm you. To my US-American brethren: the following article is a lot to read but nevertheless you may not yet have considered war strategy of distraction and attack on unprotected flank behind? Ever heard of "Red Dawn Invasion" on the American soil? Yeah, I saw that movie. "We" [US] won. Taking off my pastoral stripes for the moment, I lived through the bulk of the Cold War and know from personal experience that military doctrine at the time was such that tactical nuclear forces would be brought into play quickly to degrade or destroy overwhelming advances from the Warsaw Pact and Soviet Union. I would assume that you, Annabel, live at or near ground zero of that policy. Yes, there will be an invasion. The heavenly D-Day is coming and best of all, "they" already know it. All of the armchair general banter aside, are the people of China, Russia, Iran our enemies? For if they are then they deserve our fervent prayers. I seem to remember reading somewhere that is required of us by faith. Oh yeah, and that we win too! Annabel, thanks for the link. Good article. With everything going on in Syria, an increase in false flag events, need to determine what's behind door number two. Hopefully enough Americans know NATO is not our friend WTSHTF on our southern border. @Richard indeed I didn't really get the point with 'ground zero' but the strategy here seems to be the same how my country has been ongoing infiltrated by Islam through the mostly Turkish and Eastern Europe immigrants over the last 40-50 years now. I can clearly see a pattern here. The point...NATO had, and may still, consider use of WMD on their own soil as acceptable doctrine. My neighbourhood is changing as well and becoming even more of an International community. It is like a reverse mission. Everyone is coming to you. This makes for new opportunities in outreach but also requires a special touch as many peoples from the ME have special needs that not just anyone can address. I am aware of some great work being done in the churches in Ottawa to Syrian and other ME refugees. It is specialised ministry which I hope to partner with in the near future. @Richard: a) I'm so sorry but what is WMD? and b) 'reverse mission' yes I thought that might be the case for good opportunity to share the gospel when my country was invaded in 2014/15 on a larger scale but in fact the contrary happened: John 3:12 all over, violence and evil increasing ever since DAILY!! I'm out, definitely. Just waiting for Jesus to pick me up, doors closed (Rev3:7 b! = read for condition at end of church age) once and for all. MARANATHA! Missles fired on syria about an hour ago ! A new update at the top! "We are certain of our capabilities to protect ourselves with our own power." 9 Proclaim this among the nations: "Prepare for war! Wake up the mighty men, let all the men of war draw near, let them come up. 10 Beat your plowshares into swords and your pruning hooks into spears; let the weak say, 'I am strong,'" 11 Assemble and come, all you nations, and gather together all around. Cause Your mighty ones to go down there, O LORD." 12 "Let the nations be wakened, and come up to the Valley of Jehoshaphat; for there I will sit to judge all the surrounding nations. 13 Put in the sickle, for the harvest is ripe. Come, go down; for the winepress is full, the vats overflow -- for their wickedness is great." "...but the LORD will be a shelter for His people, and the strength of the children of Israel."